The Star Pride reportedly lost power off Cuttyhunk Island on Friday afternoon. The U.S. Coast Guard says a disabled cruise ship in Buzzards Bay on Cape Cod has passed inspection and is back on its way to New York Saturday morning. The disabled vessel, the 376-foot Star Pride, is a luxury ship that was making a cruise from Iceland to New York. It was scheduled to make its maiden docking in Manhattan on Saturday. There were more than 350 people - 191 passengers and 160 crewmembers - on board when the ship became stranded Friday afternoon, according to the Coast Guard. No injuries were reported. The Fairhaven harbormaster said the ship lost power off Cuttyhunk Island. "There was a strong vibration for about five or 10 seconds," said passenger Jose Kirchner. "Then we lost cabin lights, we lost forward power, so we slowly slowed down and we were basically adrift." The ship was anchored while the Coast Guard and tug boats raced to the scene. After 5:30 p.m., the Coast Guard said the ship had regained power. 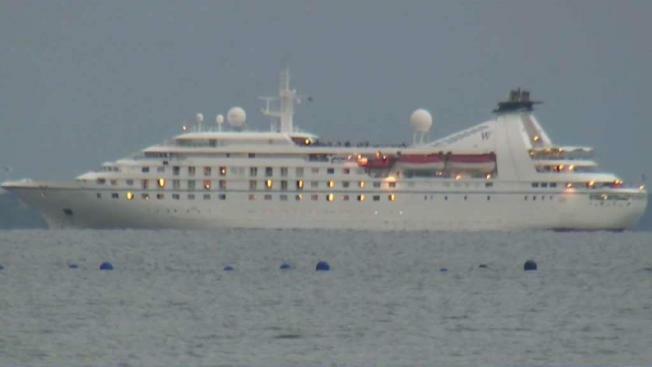 It remained anchored for some time, but Windstar Cruises, the company that operates the Star Pride, said around 9 p.m. that it was on the move to Newport, Rhode Island, where it was inspected. The ship's arrival in New York has been delayed. "By and large most people are concerned about what are we going to do tomorrow," said Kirchner. "What about our flights, that kind of thing." Windstar Cruises says the propulsion and auxiliary engines were shut down automatically after a loss of cooling water. After the power was restored, operations returned to normal and passengers were served dinner. "At no time were the 191 passengers and 160 crew and ship at risk," the cruise line said in a statement. "During the time the ship was without propulsion, the Star Pride was on emergency generator power including power to navigational equipment and essential safety systems as well as basic comforts for the passengers and crew."